This is a reverse harem urban fantasy – paranormal romance series appropriate for ages 16+. As soon as I heard of this book I knew I wanted to read it. I liked the idea of a world with dragons and dragon slayers, secrets and a Reverse Harem romance. I jumped on the chance to read an early copy of this book and excitedly started reading right away. Overall this was a good read, I easily read through it and I did enjoy the book for the most part, but I also had some issues with the book, the world didn’t come alive for me and I never fully warmed up to the characters. 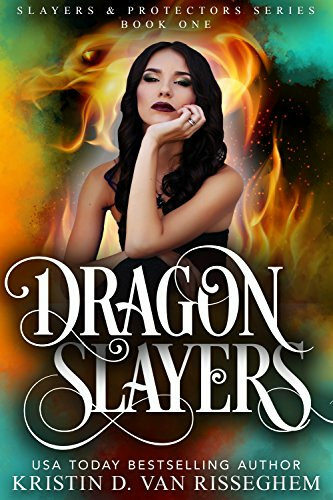 Dragons Slayers follows the story of Brooklyn who is training to become a dragon slayer at an elite school hidden in New York. We get thrown right in the middle of the story when she and her class goes out for their graduation mission. They have to kill a dragon to graduate to the next level or class. I had some trouble getting a good grip on the world, but the story flowed well. My ARC copy had some formatting issues and a bunch of grammatical/ editing errors that got me out fo the story a few times as some sentences didn’t make sense now until I realized what it should say. But those probably will be fixed in the final version. The story is a nice mix between action, the high school aspect and the romance. With the romance getting a bit more focus than the other elements, but that totally worked for me. It’s pretty low on the drama. The whole book gives these hints that more is going on with Brooklyn and that the boys are hiding something. They even tell her so a few times, but we only find out in the last chapter what it is and then the book ends. This book felt a bit like an introduction to the series of sorts. It does make me curious how things will progress in book 2. Although it was pretty easy to predict part of what was going on and I wouldn’t have minded if the big reveal had been a bit earlier in the book. the main character even suspects the part of the reveal once and then never thinks of it again. Brooklyn is a bit of a loner until someone finally reaches out to her. She doesn’t have any friends in school even tough she has been there for a year already, but I think that’s mostly due to her keeping her distance. Which is something she realized herself too. So it was nice to see her make a friend now. I did like reading about her life, but never fully warmed up to Brooklyn. Some parts of how she thought or acted didn’t fully work for me. I did like that she struggled with the killing dragons thing a bit, as that made me feel a bit sad as well that they had to kill dragons. I didn’t like how she seemed a bit too special snowflake, although with the twist at the end that suddenly makes a lot more sense. I liked how the book had a strong focus on the romance, but at the same I struggled a bit with the romance at times. I didn’t really feel Brooklyn’s connection with Manny as their relationship starts at the start of the book almost the reader doesn’t have time to get to know him much before that. There is basically no build-up at all, so it was hard to feel their romance. I did like Manny well enough, he was a nice guy who liked movies and treated Brooklyn well. But he just didn’t seem that interesting somehow and I didn’t really feel the romance with him. The second love interest is a bit of a flirt, which annoyed me a bit, although he did tone that down as things progressed luckily. The third potential love interest is a bit of the broody, moody silent type, he was a bit rude to Brooklyn at times, which I didn’t care for. But I did like how he took some time to warm up to her, unlike the other two who basically had this instant connection with her. The romance doesn’t progress further than heated kisses, but there are a lot of making out sessions with the first two boys. There was a scene with the second love interest involved that made me a pretty uncomfortable and rubbed me wrong. He is her teacher and didn’t really act like that. It felt unprofessional. In this case he takes things harder on her than on the other students and she seriously gets hurt. I am glad everyone in the book seemed to take this seriously, but I don’t get why no one questioned his ability as a teacher, as he obviously couldn’t treat Brooklyn as any other student. And while she said it would take some time to get over it and forgive him, she forgive him pretty easily. While I also wouldn’t have wanted it to get drawn out, now it felt a bit too easily resolved. I was curious how the author would handle the Reverse Harem aspect. I have to say I wans’t sure of it at first, especially when Brooklyn had a relationship with one boy already and then got close to another boy as well. That felt a bit off to me as he never said he was okay with her dating other guys. Until he did clarify that, I wasn’t too happy how she acted with the second boy. Even tough I knew this book would be a reverse harem the main character didn’t know that. And I felt uncomfortable with how far things progressed with the second boy until she knew her current boyfriend was okay with that. It made me wonder how much she cared about the first boy if she was willing to go that far with boy two without considering his feelings. Once that got resolved tough I was able to enjoy it a lot more how things progressed. And I am pretty sure I know who more will join her harem in the next book. I also thought it was a bit weird no one seemed to find it weird at all that she dated two boys. I liked the whole dragons and dragon slayer theme of the book, but felt like the world didn’t fully come alive. I had trouble getting a good feel for how things looked and worked. I just would’ve liked a bit more information about everything as now it just didn’t full make sense or come alive for me. There were lots of little things that just felt weird or unrealistic to me. Like how only those with magic can graduate and become slayers, but they never find out if they have magic until level 2. Then they are invisible for normal humans, but how this worked with the overlap between campuses and the city just didn’t make sense to me. Also how do they hide themselves when they can’t control their magic yet? Then there are teachers and some of the teachers are still students. It just seemed weird that some of the main classes were thought by level three students instead of teachers who were trained for that. And more little things like that. Most of them are small things, but they all added up over the course of the book and I wasn’t able to get as fully immersed in the stroy as I would’ve liked. To summarize: I liked this story of dragons and dragon slayers. The story moves along nicely with some high school scenes, some action, magic and a big dose of romance. There is a lot of build up and toward the end of the book there is a big reveal, which wasn’t too big of a surprise. I am curious how that will progress in later books. I did enjoy this book, but also struggled with a few things. Brooklyn was a nice enough main character, but I never fully warmed up to her. I liked that there was a lot of focus on the romance, but I had some trouble feeling the romance. With her first love interest their relationship starts at the start of the book so there’s little build-up. The second one was a bit of a flirt, but he did tone that down as things progressed. And the third love interest was a bit broody and moody and rude, although I did like it took him some time to warm up to the main character. I felt like the world building was a bit lacking, there wasn’t enough information and explanation for it to come alive and I felt some things didn’t fully make sense. Do you like books with dragons? Hmm, that would be frustrating to feel like you’re always missing information about the world of the story and that there is a distance with the characters. The overall story sounds exciting and maybe it will explain more as it goes along with the series. I just would’ve liked to know a bit more about the world as now some parts just felt like I was missing some information. And I had hoped to connect a bit more with the characters, but it still had some good parts too. I get bothered when there is a lack of world build and I am loving these reverse harem books. You totally got me started on them 🙂 I will add this one to my TBR. I am glad you enjoyed it. I wonder if the next one will help fill in the blanks for you. I am glad to hear you’re enjoying the Reverse Harem books so far :). This one had some good parts, but I am sad there wasn’t more world building. I can enjoy the teacher/ student romance type in some books, although I didn’t like how one of the teachers lost his objectivity as a teacher when it came to her and how she got hurt because of that. I LOVE dragons, Lola, so I was immediately curious about this one. I don’t know that this one is for me though. I haven’t decided what I think of reverse harem and I’m really not sure what I think of it in a high school setting. But I’m happy you enjoyed this one for the most part. It’s too bad you didn’t have a deeper connection with the characters, Brooklyn in particular. It’s hard to really enjoy a book when that connection isn’t there. Great review! I also like reading about dragons, although there wasn’t as much about the dragons as I had hoped, but that probably will change in book 2. I am enjoying Reverse Harem books so far. I agree it sure is difficult to really enjoy a book when you don’t connect with the main character. Ok, so… maybe this is because I’ve read a couple books in which I felt really bad for the dragons that got killed or almost killed, but I’m wonder *why* they’re slaying dragons in this world? Like, what have the dragons done to deserve that? Does the book explain anything about that? I’m just curious cuz the blurb doesn’t say much about that. I love the idea of reverse harems, but it would have to be done in a certain way for me to enjoy it, I think, and it seems like a lot of them wouldn’t be a way I’d like. I can def see why you were uncomfortable with her getting close to LI #2 when she already had a relationship. Yeah there is a bit of explanation about how the dragons burned down towns and such, and they provided hunters with a lot of food in the past when they killed dragons. And that made more sense for the past than the current situation. Mostly it seems the dragons have nowhere to live now that civilization has grown. So the dragons are in the cities as well and then just get killed by the hunters. It was a bit weak and it made me wonder why no one questioned this more. I have read some great Reverse Harem books, but it definitely depends on how things are set-up and progress. And it bothered me here how close she got to guy 2 without knowing that guy 1 was okay with that.